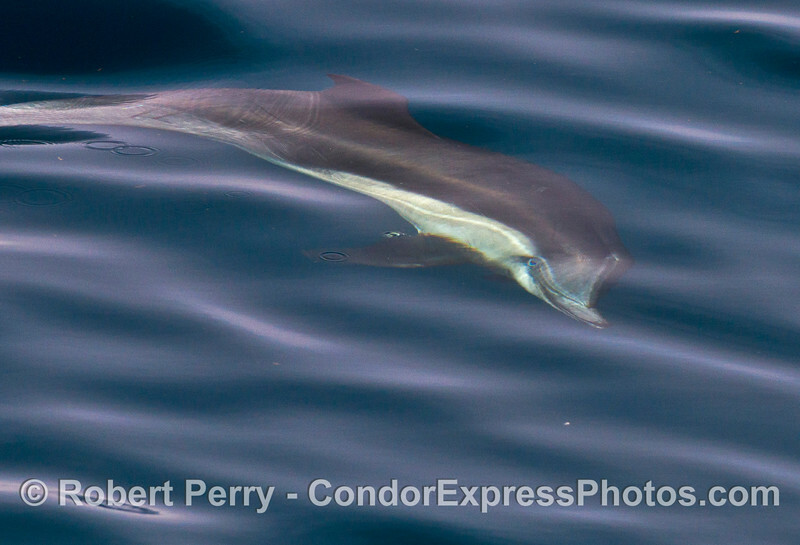 There were very very calm and glassy sea condition today on the 9am and 12 noon trips. 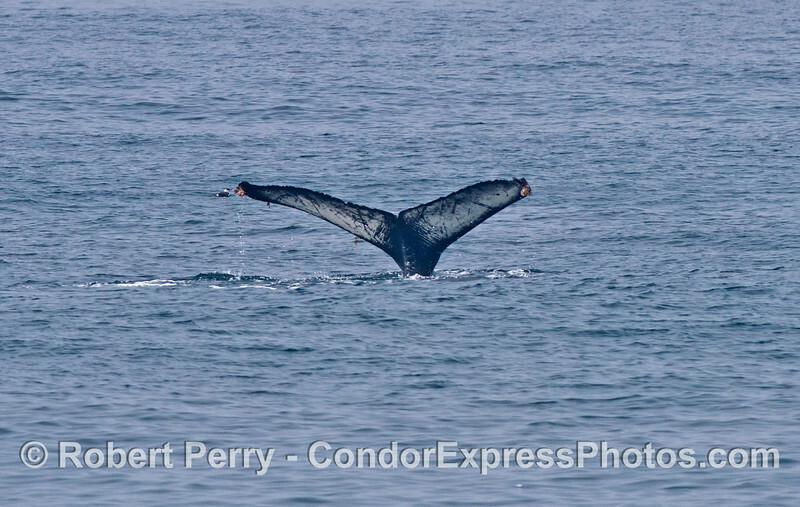 I had to leave to catch the Joe Lovano concert at Royce Hall, but there was also a 3pm adventure. 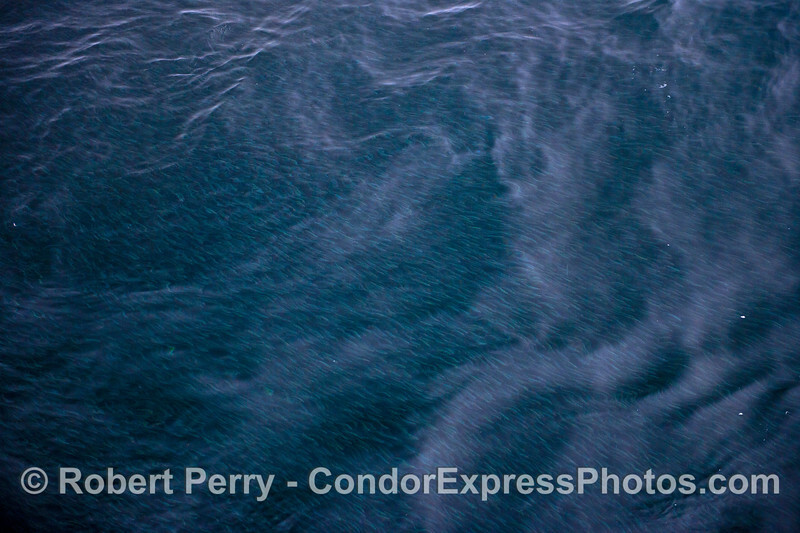 In the morning the fog greeted us and the visibility remained so poor that you could barely make out the bow of the Condor Express in the misty conditions. 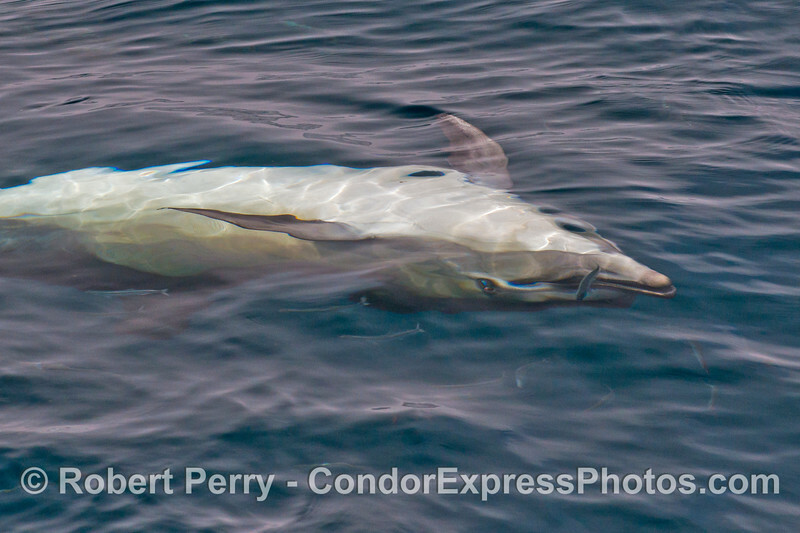 This did not stop Captain Dave from heading out to yesterday's hot spots and along the way about 1,000 common dolphins FOUND US. 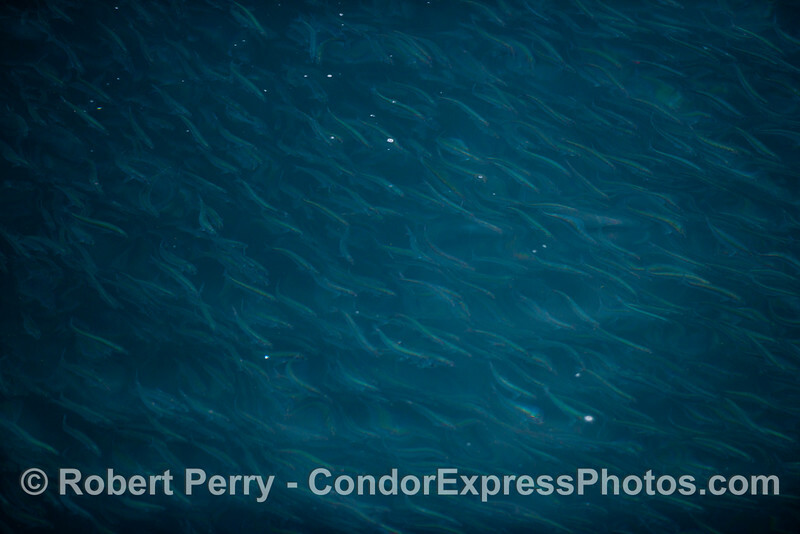 They rode the bow, ran alongside and surfed the wake as they mostly do, but soon led us into some giant bait balls full of northern anchovies. 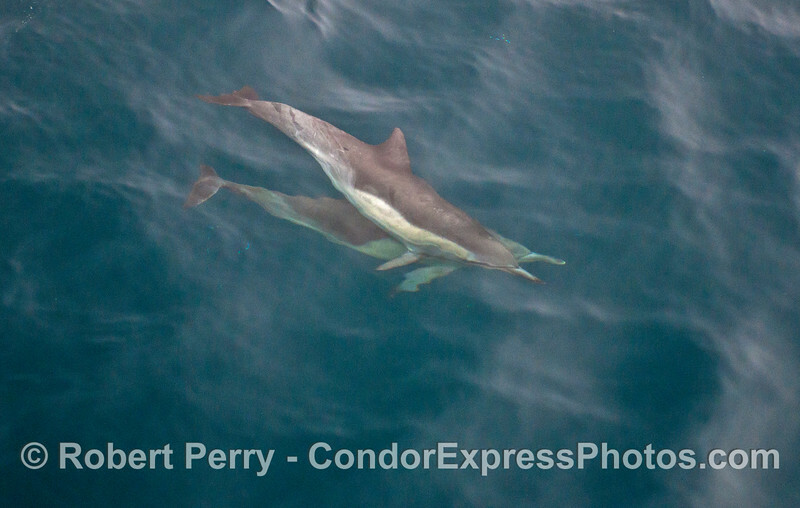 There we were with now above water visibility enjoying the spectacle that unfolded beneath the surface in the crystal blue waters. 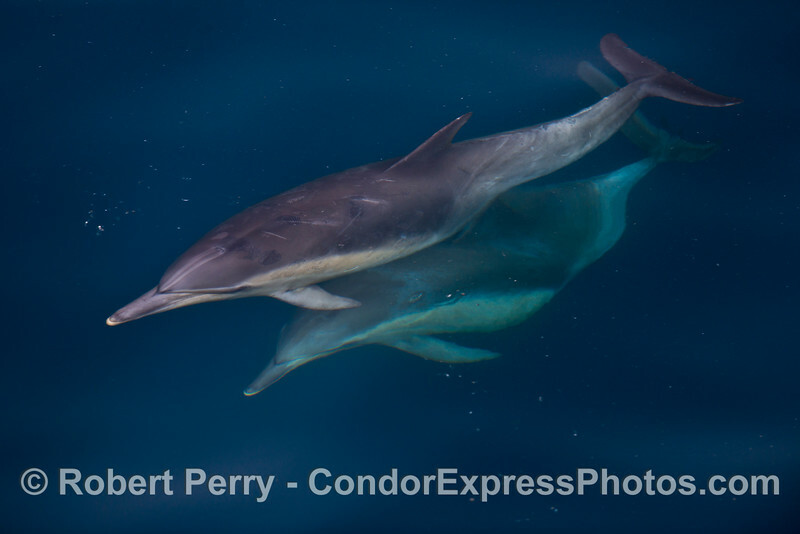 Again rivers of little silvery fish came alongside the twin hulls in a futile attempt to hide from the predatory and hungry dolphins. 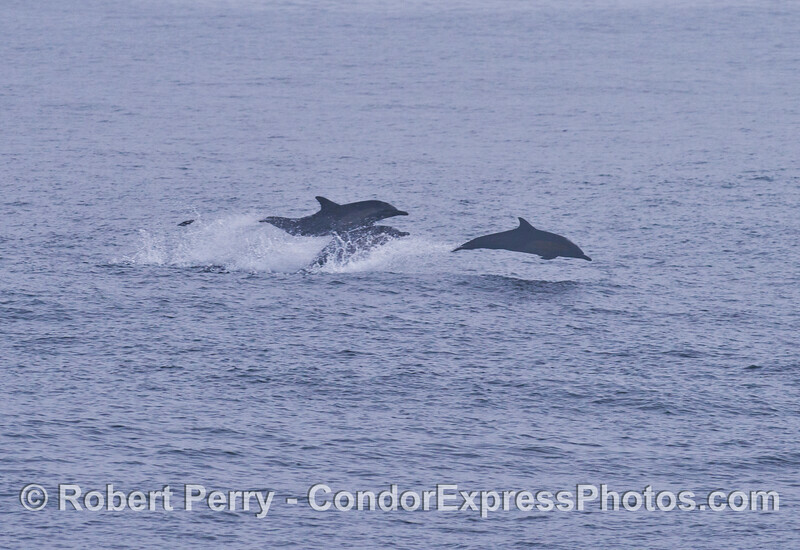 Things got a little better on the mid-day trip, and, although the dense fog stayed with us, there were a number of "sucker holes," or little spots of clearing that permitted quarter mile vistas. 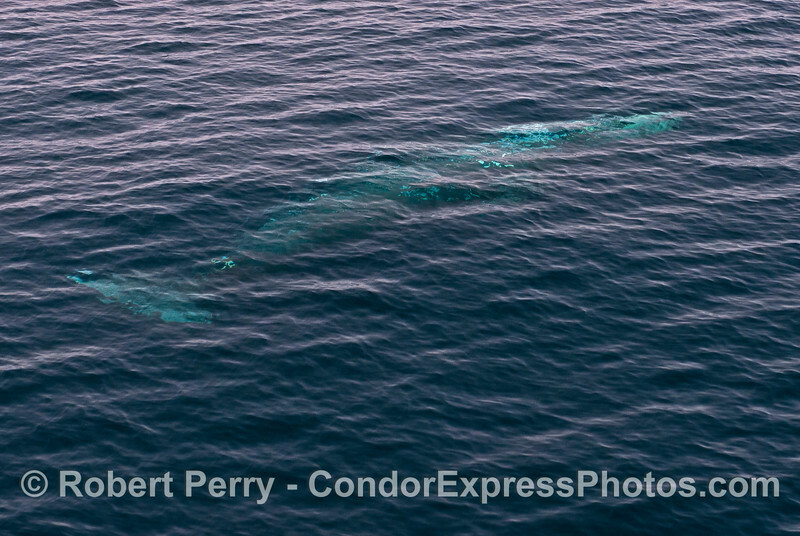 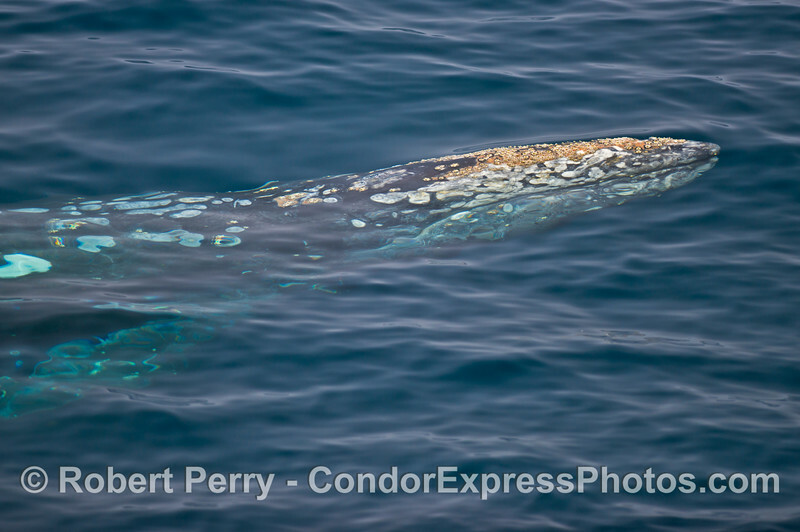 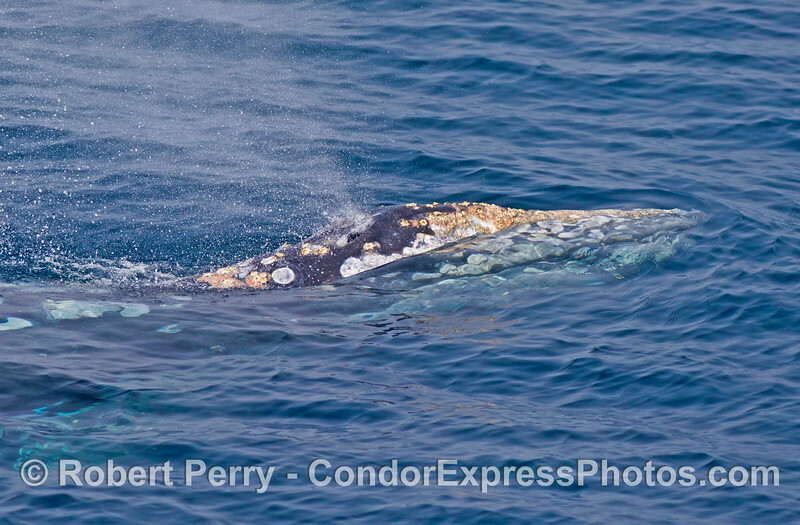 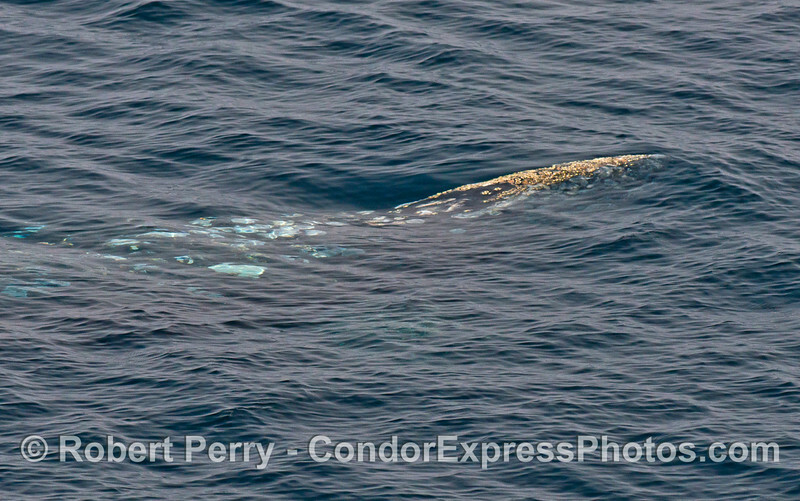 Now we not only had all the seabirds and dolphins feeding, but we came across a medium-small sized gray whale heading south. 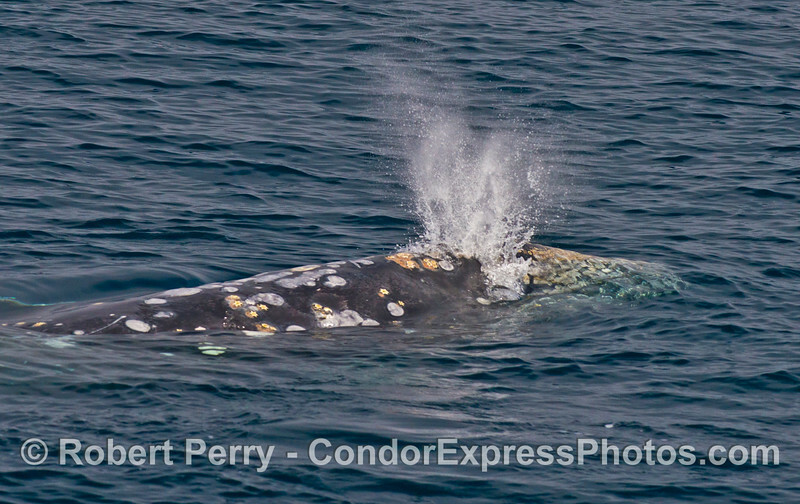 This whale did a half-way breach and that led us to some great moments of interaction between the dolphins and the gray whale; the whale rolled around and so forth in response to their presence. 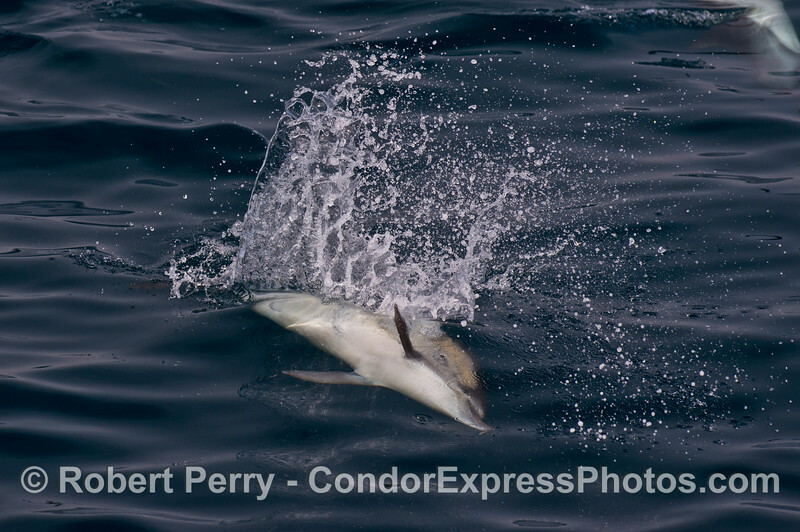 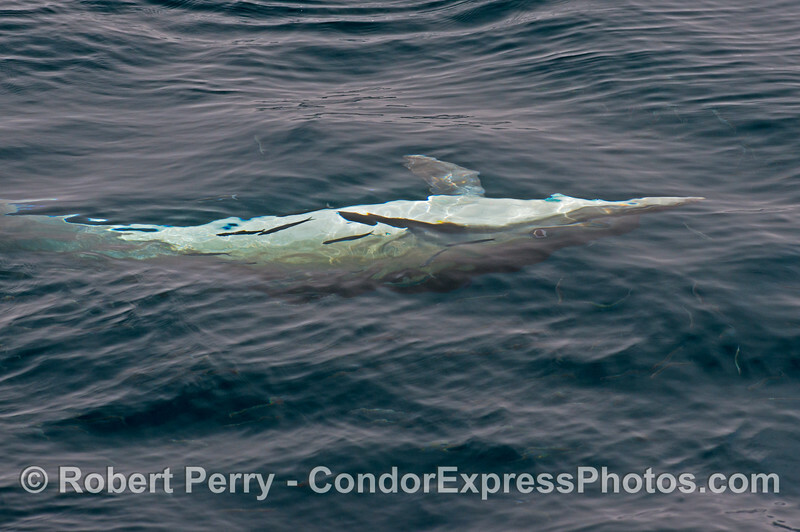 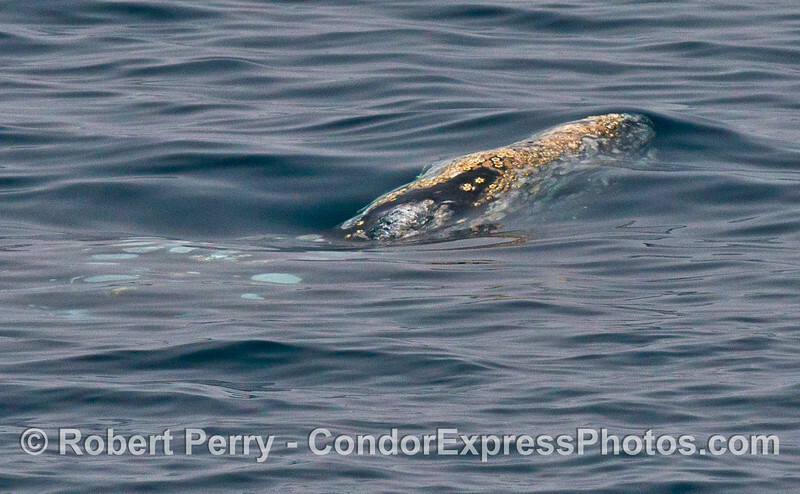 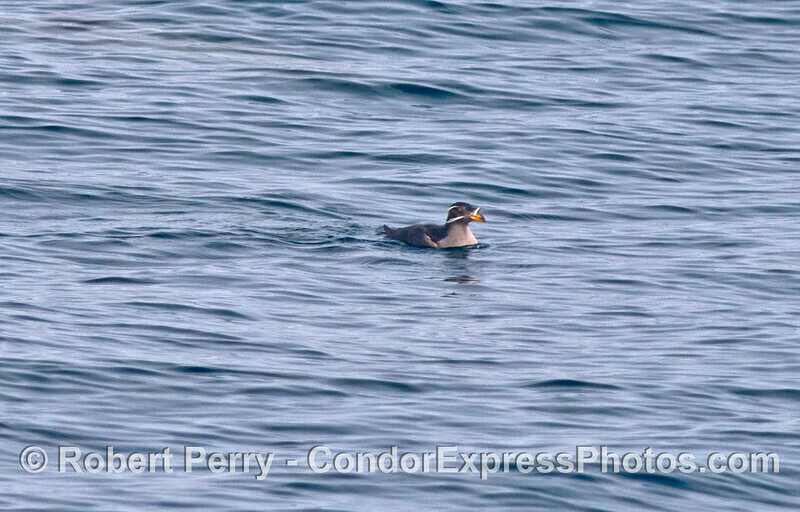 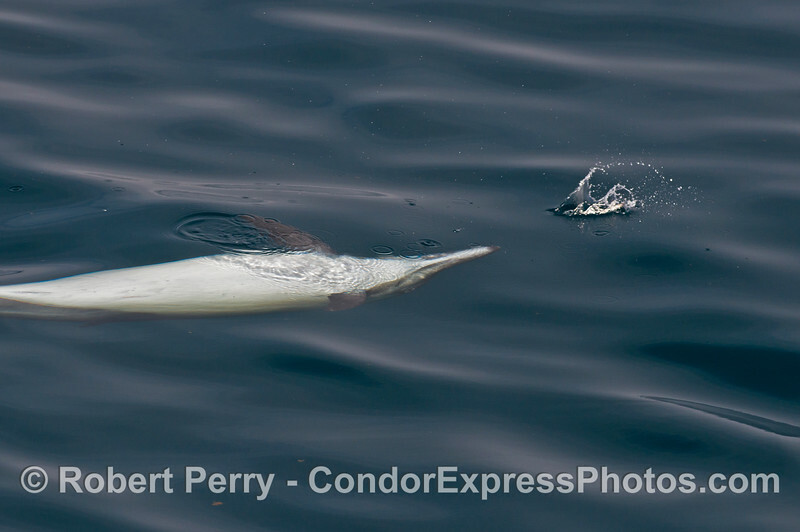 More rivers of silvery fish and predation by common dolphins was also seen. 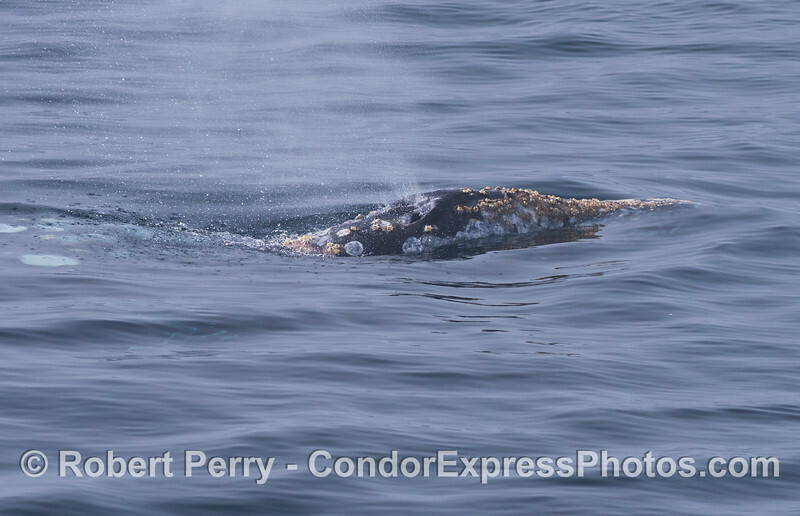 Lastly, as we were about to turn away from all this nice action and head slowly home, a single humpback whale lunged into a ball of bait on the surface and we were able to follow this animal through thick and thin fog. 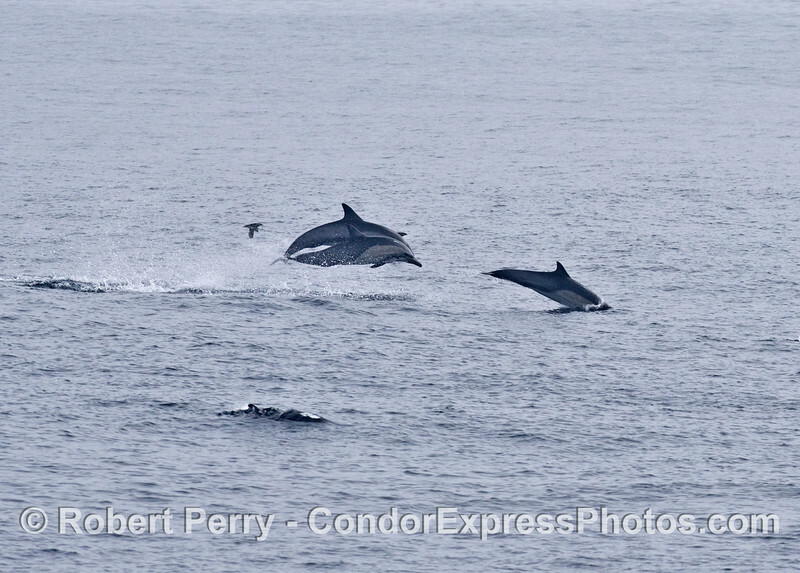 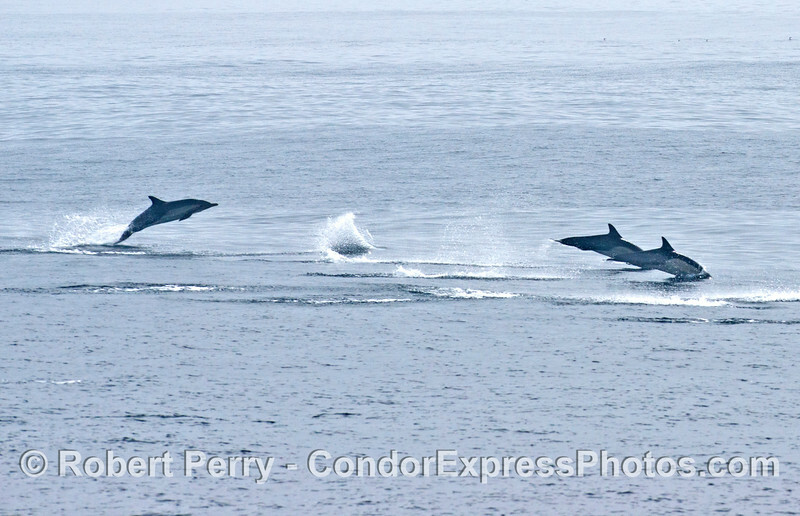 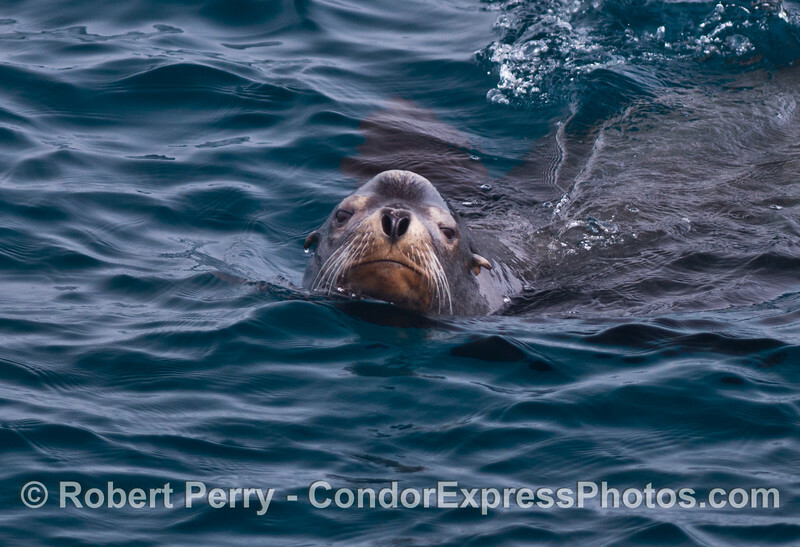 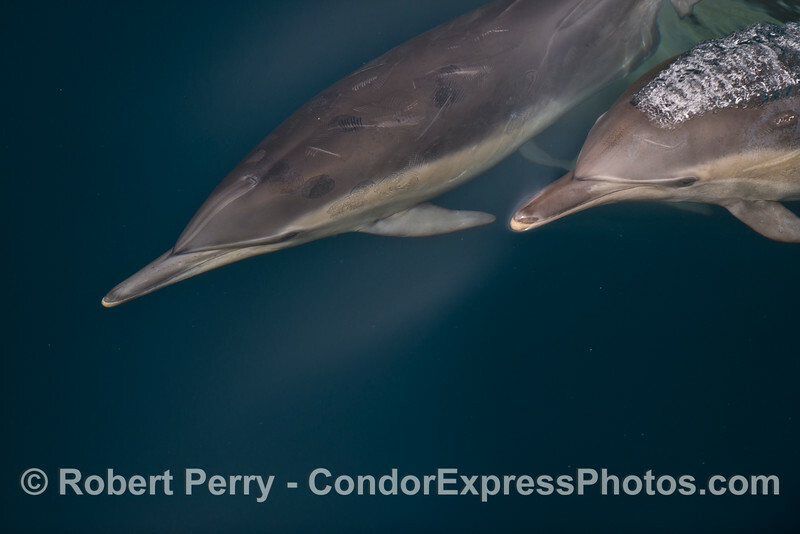 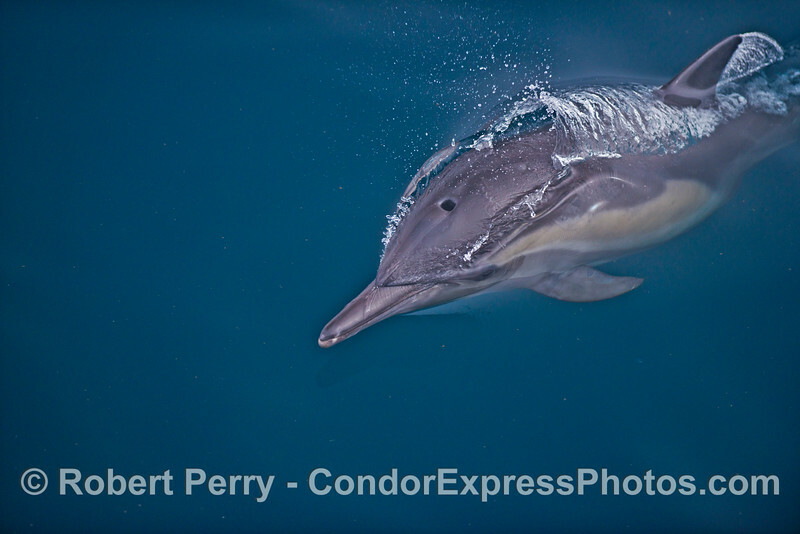 In addition to the gray whale, and the humpback whale, another 1,000 common dolphins plus a few dozen sea lions were observed. 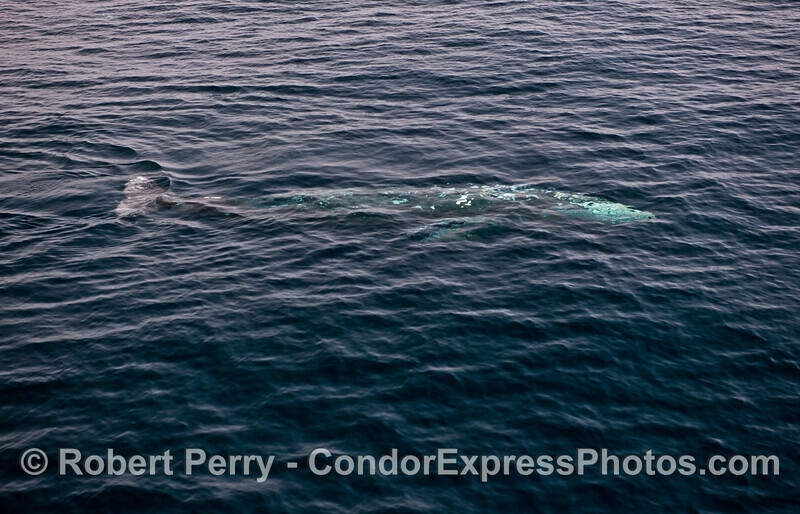 You can view the map on the bottom of this page to see where we went. 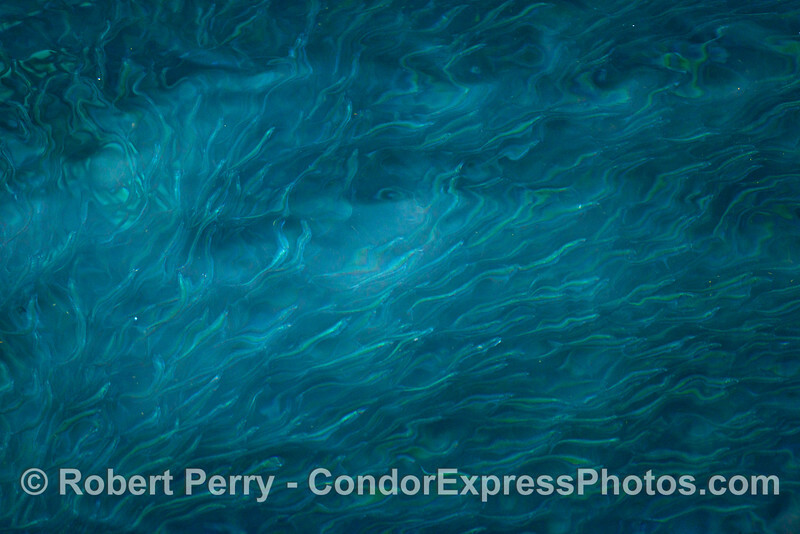 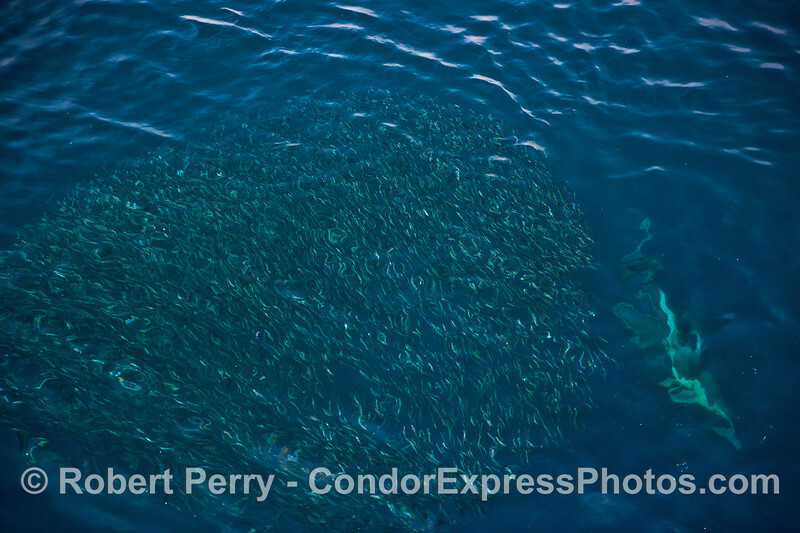 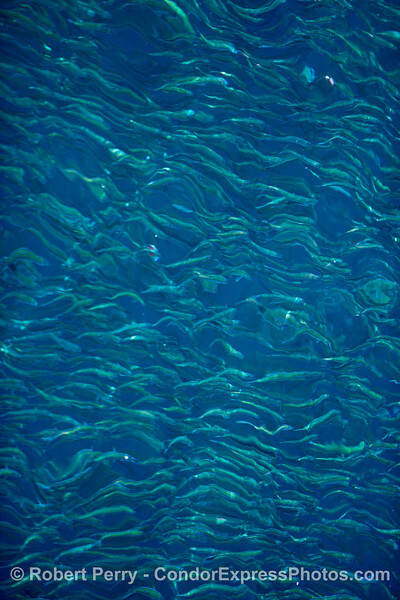 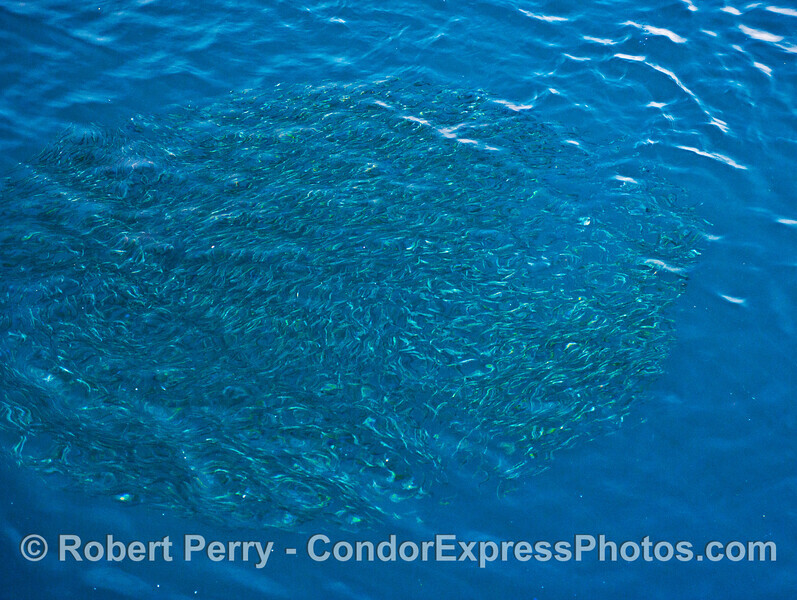 A school of northern anchovies compacted into a surface aggregation or "bait ball"